These Christmas cookies are legendary, and for good reason. They are light yet delectably rich cookies with a hint of almond in the glaze. Makes around 6-7 dozen cookies. Preheat oven to 350F. Cream butter, sugar, eggs, ricotta and vanilla. In large bowl sift flower, baking powder and baking soda. Blend into the creamed mixture. Roll dough into tablespoon-sized balls and place on ungreased cookie sheet. Bake 8-12 minutes; let cool. The glaze is simple: simply mix milk, confectioners’ sugar and almond extract until smooth. 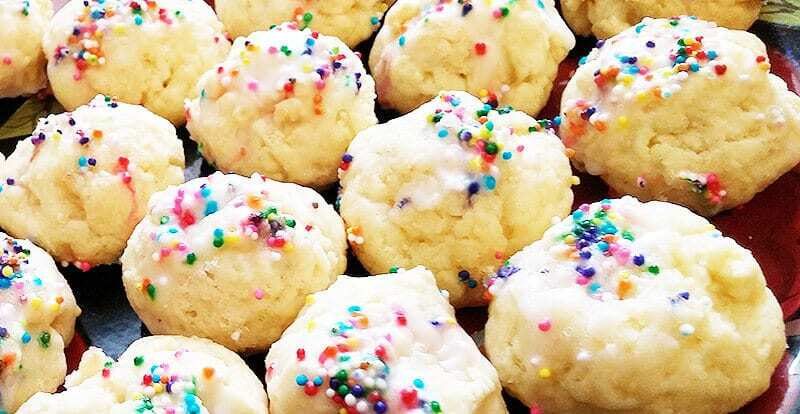 Spoon over cooled cookies and decorate with sprinkles.